We’re headed to the beach next week with some friends and I’m SO LOOKING FORWARD TO IT. In the midst of the chaos and change in our lives right now, it has been the thing we’ve been looking forward to and the light at the end of the tunnel for us. “Just make it to the beach trip” we’ve been telling ourselves. I have a countdown on my phone and everything! Without a doubt every time I go to the beach for the day I see people who bring ALL THE THINGS and look like they’re setting up shop to move in. Yet, they don’t use half the stuff they brought then have to turn around and lug it all back to the car at the end of the day. Have you seen this before? Gah, that looks exhausting and to be honest, I used to be one of them bringing way more than I need. Not anymore. 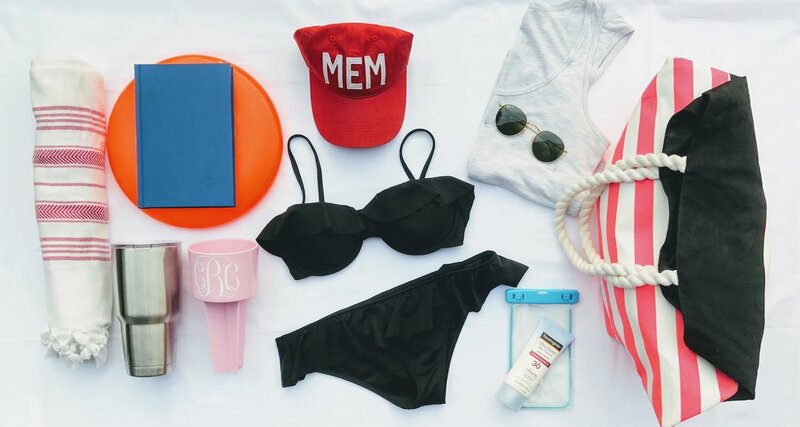 As we embrace minimalism, here are the things you’ll find in my beach bag. Make sure you have one that doesn’t “hold” the sand in… canvas is a good choice and is easy to brush off all the sand quickly. Gone are the days of your beach towel taking up your entire bag or 1 person dedicated to carrying all the fluffy towels! These Turkish towels roll up super small, dry crazy fast, and can be used for so many things (beach cover up for the ladies, table cloth, picnic blanket, etc). It’s less than $25 on Amazon and you can get it HERE. This was a gift and I’m so thankful for the person who got it for me because I don’t think I would’ve bought one for myself…. I assumed it’s just a rambler like you can find anywhere else but for cheaper. No, I was silly. This thing is legit and keeps the ice in your cup cold literally all day long (I tried it). Put this in the sand and your drink cup in the spike and you’re all set! It’ll prevent your cup from getting all sandy – which is awesome because your hands will be wet from the ocean. Normally, I’m left with sandy, wet hands that end up being a hot mess which inevitably wind up in my eyes. Basically, save your eyes and get a beach spike. Because corn hole takes way too much effort to carry around and it’s fun to have a game to play on the beach. I always bring a book to the beach. This is usually where I get the most reading done all year long. I like to have sun-kissed skin but burnt and peeling isn’t cute, so I cover up a bit with my Aviate hat or my beach fedora. If you want to score 15% off an Aviate hat representing your home town scoot over to THIS POST and get the coupon code. I don’t technically have a beach cover-up. I just throw on a tank top and wrap my Turkish towel around my waist in a cute way and I’m all set! Personally, I didn’t want to buy something I would only use a couple times a year (embracing minimalism). This is to protect my phone from the sand and water, plus it completely seals so I can take underwater photos! With this case you can still use your phone without even taking it out of the bag, pretty sweet. You can find the one I have HERE. We take THIS tent with us to escape from the sun a bit. Everyone usually takes turns being underneath it then swapping for some sun. I can’t recommend this tent enough… there are several way you can set it up. The best beach chairs we’ve found are THESE from Tommy Bahama that you carry with you like a backpack, they have a small cooler built in, lots of pouches, drink holder, neck pillow, and several options for adjusting how you sit in it. It’s basically the Swiss army knife of chairs.